In technology, there are those seminal moments when things change—really change. The debut of the Macintosh on January 24, 1984, was one of those moments. Before that day, the computer world was all command lines and arcane abbreviations. Afterward, it was all icons and mice. Although few people really knew at the time just how big a change was coming, it was the original Macintosh more than any other product that fired the first shot of the personal-computing revolution. It’s far too soon to say if the introduction of the iMac on May 6, 1998, will prove to be another of those seminal moments in computing, but it certainly marks a major change for Apple. After years of Apple’s panicked rushing to stay apace with an industry that was passing it by, the iMac puts Apple out ahead again. The reasons are simple: the iMac is innovative, elegant, inexpensive… and everyone’s going to want one. When I first saw the iMac—with Steve Jobs himself lifting the veil to reveal the amazing computer underneath—I couldn’t help but think of Volkswagen’s new Beetle. The parallels are striking. Just as the Beetle harkens back to its flower-powered ancestor, the iMac capitalizes on nostalgia for the all-in-one “classic” Mac of 1984. But that’s where the similarities between old and new end: The new Beetle is a wonder of nineties engineering, offering the latest bells and whistles with an incredibly functional, comfortable, and striking industrial design. And technology aside, there’s that striking industrial design: translucent plastics; easily accessible (but well-disguised) ports; and a more clever use of curves, angles, and varied textures than even the new Beetle can match. (The iMac, however, does lack the Beetle’s built-in flower vase.) It’s a strangely pleasing fusion of functionality, nostalgia (it even has a handle on top, just like its “luggable” progenitor), and edgy chic. So what if it looks a little like an alien chicken egg? It’s one very cool alien chicken egg. Then there’s the way Apple is wrapping up this stylish package as an Internet-access terminal for real people. The Mac is synonymous with ease of use, and the Internet is not. With the iMac, Apple may finally be able to get consumers everywhere to make the connection between those two facts. As has been discussed at some length in this column before (see “The Vision Thing,” June 1998), one of the computer industry’s consistently frustrating problems is that most of the people in the world who can afford a computer and are comfortable using one already own one. That’s not to say there aren’t literally millions of potential new computer users out there, but computers will have to become significantly more compelling before those people will pony up the cash for one. And as Windows-based PC manufacturers learned last Christmas, a small price tag alone isn’t compelling enough. With the iMac, Apple is attempting to combine the Mac’s greater ease of use, prepackaged Internet access, a relatively low price, and a unique design to make those new customers take the plunge. Steve Jobs says the iMac project started exactly one day after his installment as interim CEO last July. If so, then it can truly be said that the day Jobs stepped up to bat was the day Apple stopped following and started leading again. The iMac proves that all of Apple’s talk about “thinking different” wasn’t empty hype. 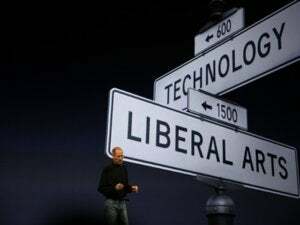 Today, Apple seems to be marching down a path different from the one it’s been treading the past few years. It’s the path taken by a company that realizes it must commit to innovation in order to succeed. And it’s right where Apple belongs. Will the iMac be as important as the original Mac? Only time will tell. But I will say this: As I sat in the Flint Center Theater on May 6, 1998, and watched Steve do his thing, it sure felt like 1984 to me.